So tonight while eating my dinner I had a revelation of sorts... what I was eating tasted completely naughty, but it was not. So I thought I start a new thing thing there called... Tastes Naughty but is NOT (TNBIN)! To highlight foods that are OK in the fat/calories department and high in the taste department. Now maybe you guys already know this secret, but seriously people this is amazing! 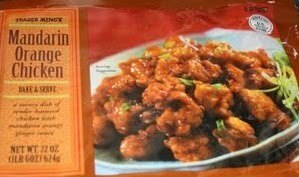 It is a complete copy of any sort of fried chicken dish you'd get at your favorite Chinese spot, but I can have 1 cup of the stuff (without sauce) for 4 points. Now really I'm not going to eat it without sauce, so 2 Tbsp = 1 point, and of course I'm not going to eat it without rice so 1/2 cup of Jasmine rice = 2 points. 7 points for a meal that at a restaurant would easily cost me 10-15. SCORE! 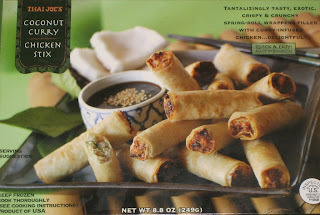 Now to let you in on another TNBIN... and something to round out your meal if you really want to splurge: Trader Joe's Coconut Curry Chicken Sticks. They are basically small egg rolls. You can have 2 of these suckers for only 2 points! So there you have it... It Tastes Naughty but is NOT! By the way... Neither Trader Joe's nor anyone else paid me or gave me anything to say these nice things about this yummy food. I bought it with my own hard earned cash so my family could have a meal tonight. We are finally getting a Trader Joe's in Omaha this fall. My husband doesn't like anything orange flavored, so that top one looks like a good option for me. And the bottom one? OMG! Yum! This reminds me that I need to start collecting names of Trader Joe's good picks (besides their peppermint oreos -- them are to die for).